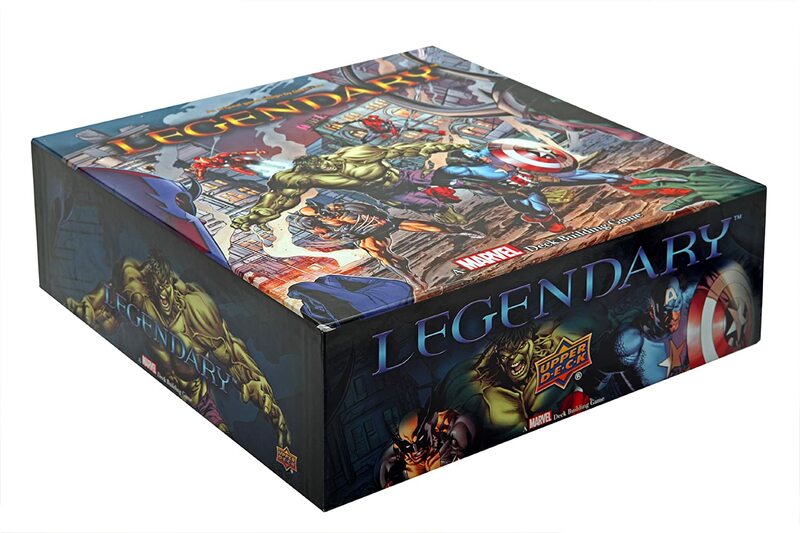 Ryan's Game Ryviews: Marvel Legendary Deck Building Game Ryivew - Now Not Broken! Marvel Legendary Deck Building Game Ryivew - Now Not Broken! Legendary Marvel Deck Building Game, by Upper Deck. It's physical game time part 2! This time, it's a Marvel game! If you're confused as to why I have a DC deckbuilding game and a Marvel deckbuilding game, don't be; I'm just that nerdy. But it actually makes quite a bit of sense, because I got them as gifts and they're nothing alike. If you read the DC Deck Building Game Ryview, you'll know that it's quite a bit like Dominion. Legendary is more like 2 different games that you're playing at once, one of which is like DC deckbuilding, and the other is like some weird RPG. The game is setup with several different heroes, each with about 12 cards assigned to them, and villain groups, each with about 7 cards. And there are also Super Villains and schemes. You pick a main Super Villain, and a scheme (both ostensibly at random). The Super will determine part of the villain deck and some characteristic for the game, whereas the scheme determines what the "Scheme twists" do, changes the setup, and defines the "Evil Wins" condition. You see, this is labeled as a cooperative game with competitive elements. You're working together to defeat the villain before the scheme decides that you lose. But every time I've played, we've never lost, and ultimately the game is definitely competitive with some cooperative elements. In the end, the winner is whoever has the most victory points, which are assigned exclusively from villains, none from heroes. Anyway, aside from poor communication on that front, it's very interesting. You randomly populate the villian deck with villain groups based on the number of players and the Super Villian's requirements, and you pick 5 heroes for the hero deck (once again, randomly is recommended but that's a terrible idea). Then, you go about the game flipping over villain cards and buying heroes, using "Recruitment" points to buy and "Strength" points to fight. Heroes have team affiliations and elements (like tech, energy, physical, strength, covert) that can sometimes helps cards stack together. Villains move through 5 spaces on the board as they're revealed, and if they go undefeated then the escaped villains cause mayhem for your hands and occasionally have horrible consequences (and or help the scheme try to beat your asses). While it seems daunting, and the DC deckbuilding game was much more down the earth and easy to pick up, Legendary offers a very unique gameplay experience that has numerous layers of strategy and differentiation. Rather than just buying a few complimentary cards, you're forced to balance recruitment, strength, affiliation, and element to actually have a useful deck. And in the end, your deck is worthless because the victory is only from defeated villains. It's a bit of a complicated game, and with the wrong setup, it can be terrible. But if you find good combinations (once again, random is a terrible idea), the game can be extremely rewarding and fun, especially for those of you who love to strategize on multiple levels at once. If you're looking for a quick deck builder where everything is spelled out on the cards and your don't need particularly long term strategy, I'd recommend DC deckbuilding or Dominion. If you want a complicated, punishing, yet rewarding game that, if set up properly, will test your wits and friendships, play Legendary. Or if you're like me, play them all when you're in the right mood.